Stability and flexibility are not the same. Nor are they entirely separate variables. A majority of people who try yoga for the first time do so to get more flexible. They’re on the right track! Yoga is highly effective for increasing people’s flexibility. Flexibility is the absolution range of motion available to you at our joints. Upavista Konasana can increase adductor and hamstring flexibility. My body became a lot more flexible in this way by practicing yoga for close to 20 years. But is increasing flexibility even good for us? I think we might be a little confused on this point. I suspect we associate (or mis-associate) flexibility with bodily health and well-being. Like maybe if our bodies are more flexible, our minds will become so, too. Or maybe our aches and pains stem from our body’s inability to yield in all the ways we want it to physically, mentally and emotionally. I’m speaking from my own experience and the perceptions I had when I was a little newer to yoga. I was convinced, for example, that all I needed to do was ‘open my hips’ and I’d see an improvement in my life, my relationships, my moods. I remember teachers implying as much, suggesting to the class that we were doing pigeon pose to release emotions. As a newer teacher, I learned to teach by imitating what I heard. I remember suggesting the ‘release of emotions’ to my students as well during hip opening sequences. “Releasing” emotions in Janu Sirsasana…fly away, emotions! Fly fly! Emotional experience and the hips are also not entirely separate variables. However, compartmentalizing complex physiological and psychological experiences is misdirected. Suggesting that the experience of emotion is something stored in a place like the hips and then attempting to release it from this place is mechanistic, at best. This manner of thinking fragments and oversimplifies the exquisitely complex and emergent nature of emotional experience. The truth is, our whole body participates in the experience of emotion. 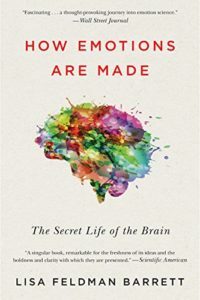 Some neuroscientists are actively challenging the old (and still widely accepted) model of emotion centers in the brain. This book completely changed the way I think about emotions. It’s one of the best books I’ve ever read on the topic. While hip flexibility is probably not entirely unrelated to our felt sense of emotion (because it’s all connected) to focus on passively stretching our hips as a means to treat our emotions is incomplete at best. Why do we tell the story this way, then? Since asanas are especially effective for helping us improve our flexibility, and many people experience noticeable improvements in their moods from practicing yoga – things like a greater capacity for relaxation and ease – it’s an easy, but overly simplistic mental leap to attribute this improvement to increased flexibility. All of this to say: we have biases and blindspots that we operate from largely unconsciously. And before we get all down on this quality of human nature, let’s remember we have to come from somewhere. I think it’s valuable, though, to recognize what our biases and blindspots are, so we can continuously refine our beliefs with an understanding more in line with what is actually going on. This way, we can continue to refine our decisions and our values so that they better align with one another. Yoga asana’s bias is toward increasing flexibility. Leveling up to harder poses usually means working increasing ranges of motion. Meanwhile, resistance doesn’t increase because we’re only ever working with body weight. As our flexibility increases, our practice may not serve to help us increase our strength commensurately. The good news is that while stability and flexibility are not the same things, they are connected because we can have both! Stability is the ability to resist force, like the forces that move us in ways we don’t want to move. We can be both flexible AND stable. This is known as mobility. More emotions releasing – but this time through the exploration of active range of motion. Adductor slides with a resistance band challenge ROM in hip abduction by actively challenging strength in the adductor muscles. We explore this exercise in my Yoga with Resistance Bands class Half Moon Hip Resilience. Mobility is the ability to move without restrictions to flexibility, strength, balance or coordination. What I’ve just shared wth you took me years to articulate. I’m learning to articulate it in more and more ways. Most excitingly, I’m articulating it through my teaching with an exciting new offering. I’m so proud and excited to share this teaching with you now in my online Yoga with Resistance Bands! YwRB offers an approach to yoga that improves your mobility by loading your body with the external tension of resistance bands. These classes marry strength and flexibility teaching you creative, new takes on some oldie but goodie poses and offering you a means by which to increase your strength in meaningful ways.